My family is one of those that loves to make HUGE Thanksgiving dinners so that they can have weeks of left-overs. My husband looks for any excuse to make a turkey dinner too. 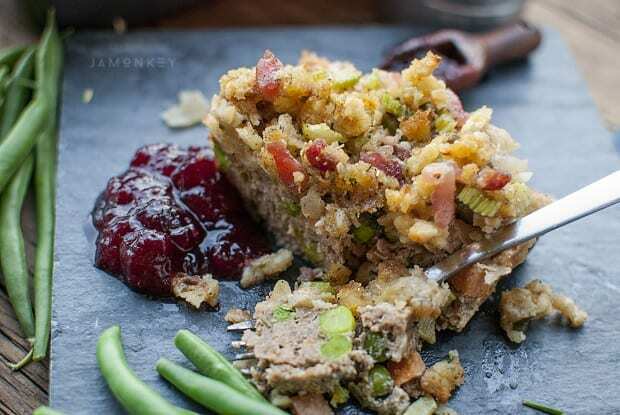 This easy Thanksgiving Turkey Dinner meatloaf is the perfect thing to hold you over until the big holiday. It's simple to make and has all the flavors you love all rolled into one pan. In a bowl, combine turkey and all seasonings except 1 T Poultry Seasoning. Mix thoroughly and let marinate in the fridge for 30 minutes. Meanwhile, in a frying pan, sauté onion and celery till soft. Season with Salt and Pepper. Add chopped bacon and cook thoroughly, but not crispy. Set aside in a bowl. Remove turkey from the fridge and add the egg and frozen vegetables. Mix thoroughly. Divide evenly and transfer the turkey mixture into two greased loaf pans. Pack the mixture in tightly and smooth the top. 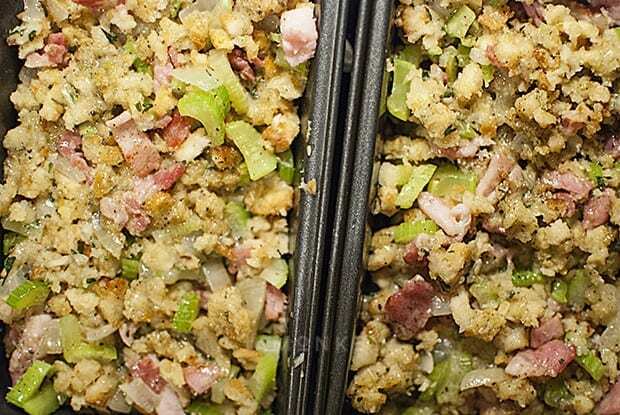 Follow with topping the turkey mixture with the prepared stuffing mix. Divide in half and spoon on top. 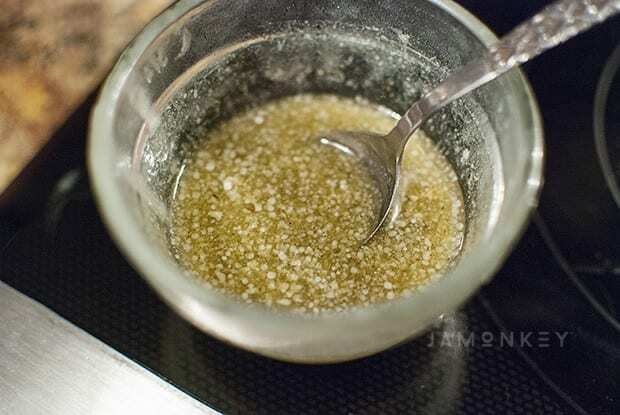 Add 1 T of poultry seasoning to the melted butter. Drizzle the butter over the stuffing on both loaves. Bake in the oven for 40 minutes or until topping is slightly crispy and browned. The internal temperature of turkey should be 165 degrees. 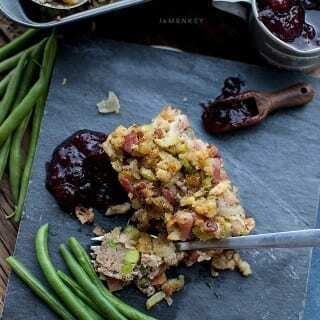 Let sit 10 minutes and serve with cranberry sauce on the side! I love all the colors in this dish. It immediately makes me long for fall and big family dinners. In a bowl, combine turkey and all seasonings except 1 T Poultry Seasoning. Mix thoroughly and let marinate in the fridge for 30 minutes. Meanwhile, in a frying pan, sauté onion and celery till soft. Season with Salt and Pepper. Add chopped bacon and cook thoroughly, but not crispy. Set aside in a bowl. Prepare the stuffing according to the box directions. After adding water and rehydrating, add the bacon mixture and mix thoroughly. Set aside in a bowl. 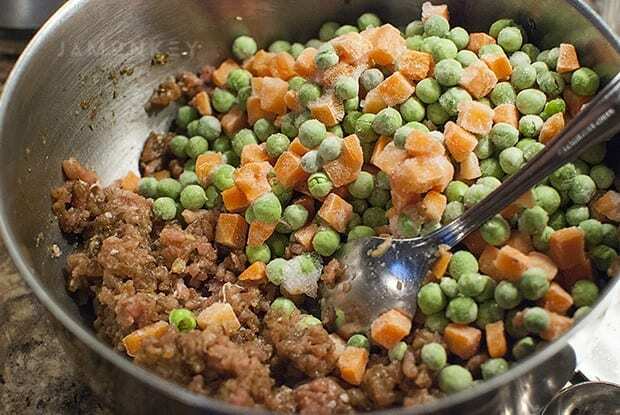 Remove turkey from the fridge and add the egg and frozen vegetables. Mix thoroughly. 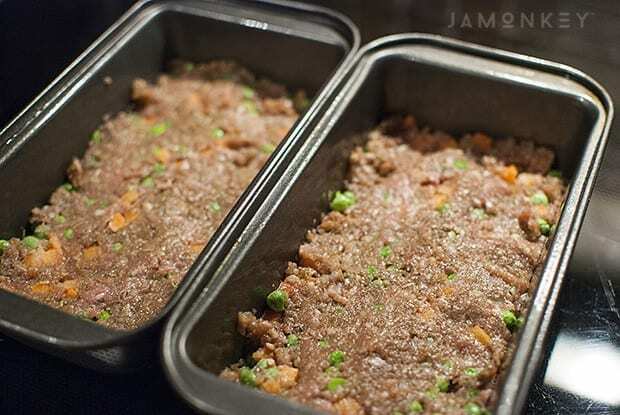 Divide evenly and transfer the turkey mixture into two greased loaf pans. Pack the mixture in tightly and smooth the top. Follow with topping the turkey mixture with the prepared stuffing mix just prepared. Divide in half and spoon on top. Bake in the oven for 40 minutes or until topping is slightly crispy and browned. 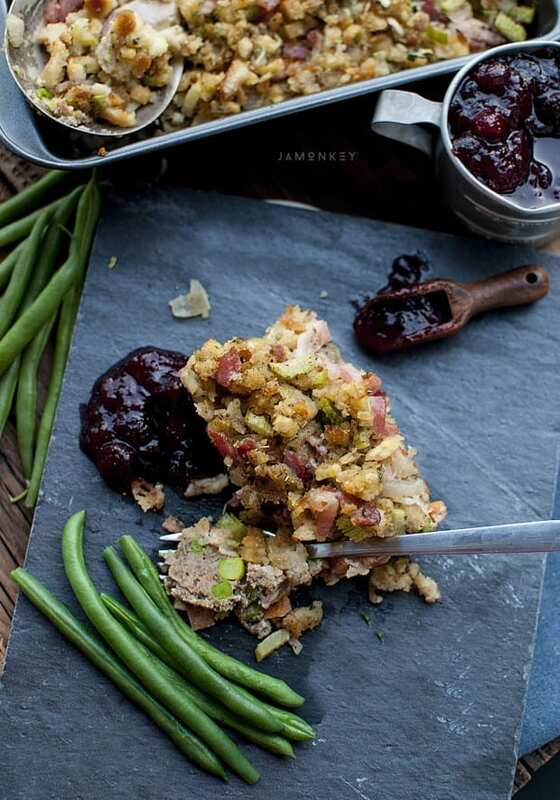 Let sit 10 minutes and serve with cranberry sauce on the side! HINT: This dish is even BETTER on the second day! 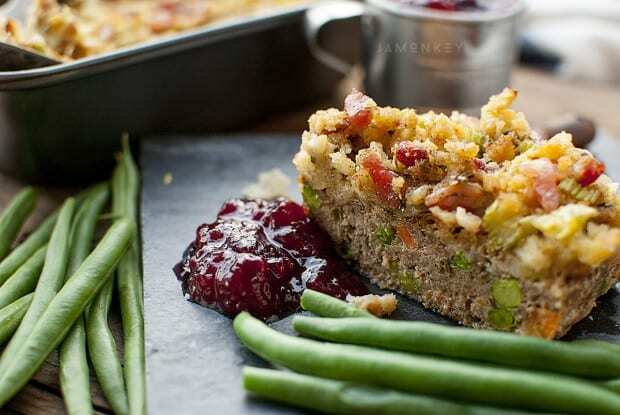 I loathe traditional meatloaf, but this one looks pretty good… I’ll try it! It’s something different for sure. But if you love Turkey dinner, it’s a keeper!